Search no further, our testimonials of our company’s service are true. 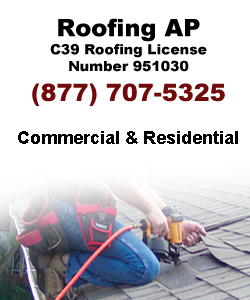 As Los Angeles Top Roofing Contractors we handle any roofing project while making it affordable from start to finish. With Roofing AP, every one of our customers is given the roofing industry’s best manufacturer’s warranties as well as workmanship guarantee — that’s right every roofing repair project carries a strong guarantee without paying a service fee or commissions. If you live in Southern California, we’re glad you want to compare us to your current roofing estimates. Please Fill out the form below. One of our representatives will contact you in the next 24 hours.